Our whole bean coffee comes in three different roasts … Medium (our favorite), Café (a multi-colored blend of medium, medium/dark, and dark roasts), and Dark (great for espresso). 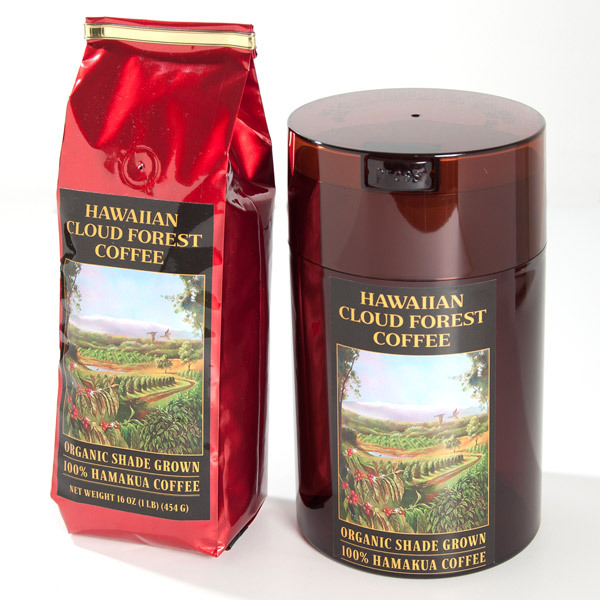 For orders in excess of 9 pounds, please email us at erik@hawaiiancloudforestcoffee.com or contact us by phone at (808) 936-3188. We also offer an air-tight 16-ounce Vacuum Coffee Canister with one pound of our whole bean coffee included (please specify roast). This is an ideal storage container for your coffee once you have opened the bag. Remove the lid by pressing on the tab … empty the beans into the container … press the tab again and push the lid back down onto the container which removes the air. Then just store it at room temperature in your cupboard. This will keep your coffee fresh! Our “Coffee Club” allows you to receive your coffee on a regular schedule of your choice … monthly, every other month, or quarterly. We will automatically send your whole bean coffee to you -- just click on your preferred plan and we will do the rest. There is no obligation to continue and we hope you will enjoy our coffee. 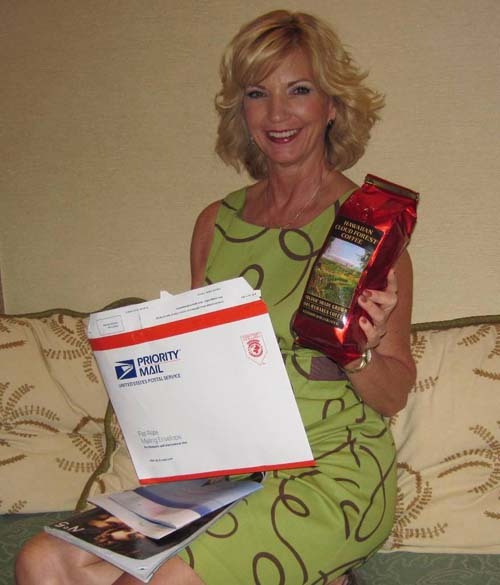 We will charge your credit card and send a receipt each time your coffee is shipped. Visitors are welcome … by appointment only please! Look around...go to Kona, Columbia, Africa, Jamaica...anywhere. You'll come back right here when you want the best fresh roasted beans in the world. Use a pour over setup and study the technique and trust me, you won't be disappointed. Best cup of coffee hands down! We love it! We have been buying them for years! We love the medium roast as well as the cafe blend! Simply the best cup of coffee we have ever made at home. When we run out and have to substitute, the difference is crazy! We can't recommend this coffee enough!!! This is by far the very best coffee we have ever tasted. It has spoiled us for any other brand. Smooth, bold, and oh so good! I buy this coffee for my son-in-law for Christmas each year. He loves it! I used to order Kona from Koa, and from Maui Grown Coffee. After trying this at Merrimans on the big island I ordered a small bag. I grind my own beans and brew in French press every morning. This has quickly become my favorite coffee and drink daily. I’ve made several orders now, they are shipped promptly and without issue. I also find the price to be a great mark where I’m happy to drink this every day. I couldn’t be happier since finding this business.